As predicted, the Fruity Monkeys were the first socks of the new year. Eight days, and believe it or not I worked on other things in the meantime. Mostly Girasole, which *will* be finished while the new year is still young. Hopefully this will help inspire me to finish some of the longstanding WIPs and also to get things done in a timely fashion. A pattern I test-knitted also just became public. 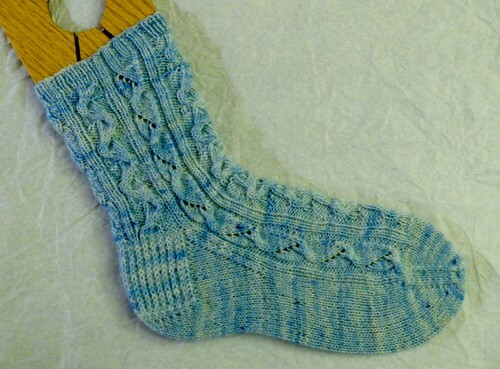 Though I usually knit socks 2 at a time, this is just the one finished – knit single in the interest of time. The second one is a bit into the leg, but not one of my designated socks for this month. I believe this is my first purchase from Sock Summit that I’ve knitted up… well, partially. One Comment | Scroll down or click here to add your own comment! 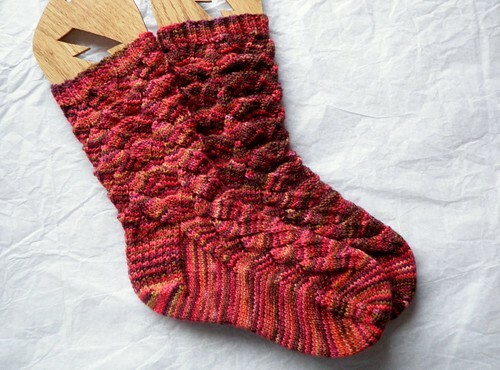 I love your blog and all the socks!